Editor’s Note: This is the Part 1 of a two-part series. Karl Wecker, a musician, educator and director who was brought from Cincinnati in the 1920s to head the music program at the Grand Rapids Junior College, was appointed the first Music Director of the Grand Rapids Symphony when it was officially organized in January 1930. Three years later, the new, 4,500 seat Grand Rapids Civic Auditorium officially opened in January 1933 with a performance by the Grand Rapids Symphony. That season, six concerts were performed on Saturday evenings in the auditorium that later would be renamed Welsh Civic Auditorium. During his 10 years as Music Director, Wecker favored the symphonies of Beethoven and the overtures and preludes of Richard Wagner as well as music by several minor American and British composers whose music the Grand Rapids Symphony never would perform again. But he also conducted the first performance of Gershwin’s “Rhapsody in Blue” in January 1938. 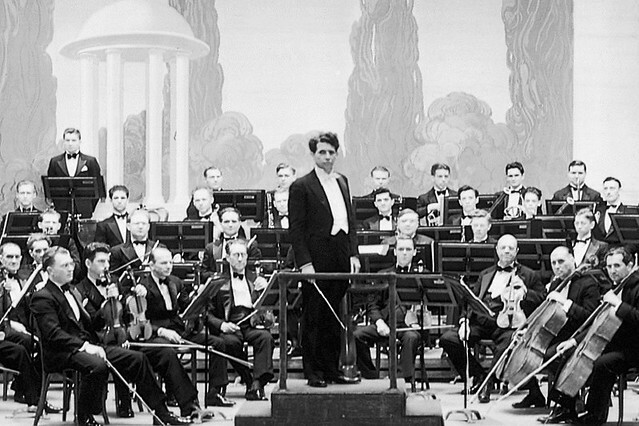 Guest artists appearing with Grand Rapids Symphony under Wecker included pianist and composer Percy Grainger in February 1936 in own compositions including “Colonial Song,” “Spoon River” and “Danish Folk Music Suite.” The Australian conductor returned in November 1939 as soloist in Tchaikovsky’s Piano Concerto No. 1. In 1940, Wecker resigned to take a post with the Federal Music Program in California, and he would later go on to become director of the Hollywood Bowl. The internationally renowned American conductor Thor Johnson made his Grand Rapids debut in March 1939 and replaced Wecker as the Grand Rapids Symphony’s second Music Director to open the 1940-41 season. Two years later, Johnson left in 1942 to join the U.S. Army at the height of World War II. Johnson enlarged the orchestra’s repertoire to include music by such diverse composers as Georges Enesco, Cesar Franck, Christoph Willibald Gluck and Darius Milhaud. Famous soloists included cellist Gregor Piatigorsky as soloist in Antonin Dvorak’s Cello Concerto in B minor in April 1941. After the war, Johnson would go on to become Music Director of the Cincinnati Symphony Orchestra in 1947, making him the youngest, America-born Music Director of a major American orchestra. He later was a professor of music and director of orchestral activities at Northwestern University and Music Director of the Nashville Symphony Orchestra. Russian-born Nicolai Malko took the podium in 1942 as the third Music Director of the Grand Rapids Symphony. Previously a professor at the Leningrad Conservatory (now the St. Petersburg Conservatory) and conductor of the Leningrad Philharmonic Orchestra (now the St. Petersburg Philharmonic) in the 1920s, Malko conducted the world premiere performances there Dmitri Shostakovich’s Symphony No. 1 in 1926. The following year, Malko conducted the premiere of Shostakovich's Symphony No. 2, which had been dedicated to Malko by his former pupil. In 1929, Malko left the former Soviet Union and settled in the United States in 1940. With many musicians serving in the U.S. military, the Grand Rapids Symphony saw its ranks grow from just a handful of women to more than one-third of chairs occupied by women. During the war, a U.S. military weather school was housed in the Pantlind Hotel (now part of the Amway Grand Plaza) and in Civic Auditorium, so the orchestra moved its concerts to nearby Keith’s Theater in 1943. In 1944, the Grand Rapids Symphony launched its Fifth Grade Concerts, an important educational outreach that continues today reaching more than 22,000 students annually. Malko introduced Grand Rapids audiences to the music of Alexander Glazunov, Jacques Ibert and Vassili Kalinnikov. Guest soloists during his four years in Grand Rapids include pianist Claudio Arrau performing Frederic Chopin’s Piano Concerto No. 1 in E minor in March 1945. Malko continued as director of the Grand Rapids Symphony until 1946. In later life, he would serve as principal conductor of the Yorkshire Symphony Orchestra in Great Britain and as Chief Conductor of the Sydney Symphony Orchestra in Australia. Rudolph Ganz, a Swiss-born pianist and conductor, became the fourth Music Director of the Grand Rapids Symphony in 1946, holding the post for just two seasons while teaching at Chicago Musical College. As a composer, Ganz performed the world premiere of his own Piano Concerto in E-flat Major with the Chicago Symphony Orchestra in February 1941. During the 1940s, Ganz also held posts for nine years as permanent conductor of the Young People’s Concerts with the New York Philharmonic and with the San Francisco Symphony and a similar role for two years with the Chicago Symphony Orchestra. Ganz’s contributions to the Grand Rapids Symphony’s repertoire include the local premiere of Samuel Barber’s Adagio for Strings and George Gershwin’s Concerto in F for Piano. He also programmed two works by Michigan composers, Carl Gehring and H. Owen Reed, to open the 1947-48 season. Cuban-born pianist and conductor José Echániz became the Grand Rapids Symphony’s fifth Music Director in 1948, four years after he joined the faculty of the Eastman School of Music in Rochester, New York. Earlier, Echániz’ 20-year career as a soloist included an appearance with the Grand Rapids Symphony in February 1938 with Edvard Grieg’s Piano Concerto in A minor under Karl Wecker. During his tenure as Music Director, Echániz was soloist and conducted the orchestra from the piano with Mozart’s Piano Concerto No. 26 in D Major in April 1951. Désiré Defauw, a Belgian violinist and conductor, was named the sixth Music Director of the Grand Rapids Symphony in 1954. Before coming to Grand Rapids, he was Music Director of the Montreal Symphony Orchestra from 1941 to 1952 and of the Chicago Symphony Orchestra from 1943 to 1947. Pianist Leon Fleisher, performing Rachmaninoff’s “Rhapsody on a Theme of Paganini,” was among the guest soloists under Defauw’s leadership. He retired after leaving Grand Rapids. Robert Zeller became the seventh Music Director in 1959, and the Grand Rapids Symphony broadened its horizons in many ways including complete concert performances of Tchaikovsky’s “The Nutcracker” and “Swan Lake,” joined by two dancers as soloists. In his first season, the Grand Rapids Youth Symphony was organized in 1959 and gave its first concert the following year in St. Cecilia. During his era, concerts were near sell-outs at the Civic Auditorium, and talks began on building a new orchestra hall. The orchestra gave its first performance of Brahms’ “A German Requiem” with the University of Michigan Choir in March 1961. In 1962, the Grand Rapids Symphony Chorus, originally called the Grand Rapids Symphonic Choir, was launched under the inspiration of board member and philanthropist Mary Ann Keeler. In February 1964, the Symphony Chorus participated in a performance of Verdi’s Requiem. Guest soloists during Zeller’s years in Grand Rapids included violinist Isaac Stern to perform Brahms’ Violin Concerto D Major in April 1960, and Benny Goodman to perform Mozart’s Clarinet Concerto in A Major in December 1963. After leaving Grand Rapids, Zeller moved to Europe, residing in Rome, and conducting orchestras in Copenhagen, Paris and Vienna as well as in Italy. Carl Karapetian, a native of Detroit, was appointed the eighth Music Director of the Grand Rapids Symphony in 1964. Guest artists included the Modern Jazz Quartet playing two works by the quartet’s pianist John Lewis in November 1967; and organist Virgil Fox performing Handel’s Concerto for Organ in F Major Op. 4, No. 4, in January 1968. The Grand Rapids Symphony extended the scope of its activities, beginning with an administrative office in Grand Rapids’ venerable Exhibitor’s Building at 220 Lyon St. NW. Grand Rapids Symphony in partnership with Civic Theatre and other arts organizations helped found the Arts Council of Greater Grand Rapids in 1967. In 1967, the Opera Association of Western Michigan – now known as Opera Grand Rapids – was launched with a production of “The Marriage of Figaro” directed by Paul Dreher of Grand Rapids Civic Theatre with Karapetian conducting. A native of Prince Albert, Saskatchewan, Canada, the son of a Greek immigrant father and a French-Canadian mother, Gregory Millar, the Grand Rapids Symphony’s ninth Music Director, didn’t have far to travel from his previous musical home. As Music Director of the Kalamazoo Symphony Orchestra from 1961 to 1968, he had been the first full-time resident conductor in the history of the KSO. In 1960, Millar became one of three assistant conductors to Leonard Bernstein and the New York Philharmonic. Five days later, his stood before the New York Philharmonic in Carnegie Hall with an audience behind him. An ailing Bernstein summoned him from the audience, handed him the baton backstage, and sent him out to conduct the final piece on the program. In Grand Rapids, by hiring out-of-town musicians to fill certain key positions in the orchestra, Millar began the first steps in the evolution of the Grand Rapids Symphony from a community orchestra to a professional, regional ensemble. The Grand Rapids Symphony hired its first full-time manager in 1969. The following year, with the help of Congressman Jerry Ford, who would later become President Gerald R. Ford, the orchestra received its first federal grant to organize a string ensemble to perform in schools in Kent County and to make available tickets to disadvantaged children to the orchestra’s Young People’s Series. Under Millar, the Grand Rapids Symphony gave its first performances of Hector Berlioz’ “Symphonie Fantastique” in January 1969 and of Bela Bartok’s Concerto for Orchestra in February 1971. The orchestra’s first-ever performance of William Walton’s “Belshazzar’s Feast in December 1969 featured the Grand Rapids Symphony Chorus and baritone soloist Russell Christopher, a Grand Rapids native on the roster of the Metropolitan Opera in New York City. In 1973, Millar was appointed artistic director of the National Opera and Symphony of Mexico, the first North American to hold a national music post in Mexico. Editor's Note: Part 2 coming soon.